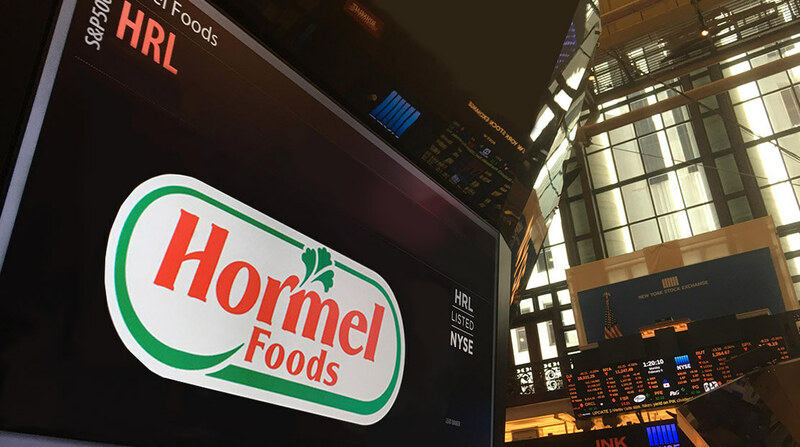 The Board of Directors of Hormel Foods Corporation (NYSE:HRL), a multinational marketer of consumer-branded food and meat products, has declared a regular quarterly dividend of nineteen cents (19¢) per share on the common capital stock of the corporation. The dividend is to be paid Nov. 15, 2009, to stockholders of record at the close of business on Oct. 24, 2009. This is the 325th quarterly dividend. Hormel Foods Increases Annual Dividend The Hormel Foods Board of Directors announced its 44th consecutive annual dividend increase. Hormel Foods Reports Third Quarter Results Hormel Foods reported its performance for the fiscal year 2009 third quarter. Hormel Foods Corporation, based in Austin, Minn., is a multinational manufacturer and marketer of consumer-branded food and meat products, many of which are among the best known and trusted in the food industry. The company leverages its extensive expertise, innovation and high competencies in pork and turkey processing and marketing to bring quality, value-added brands to the global marketplace. The company is a member of the Standard & Poor’s 500 Index, and in each of the past ten years, Hormel Foods was named one of “The 400 Best Big Companies in America” by Forbes magazine. The company enjoys a strong reputation among consumers, retail grocers, foodservice and industrial customers for products highly regarded for quality, taste, nutrition, convenience and value. For more information, visit https://www.hormelfoods.com.